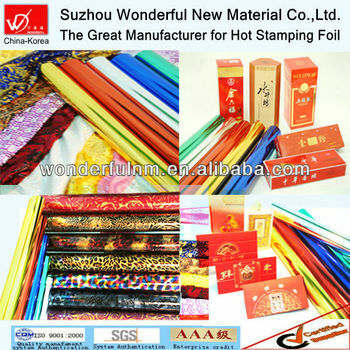 1) Rich and colorful designs and patterns, suitable for whole transfer,part transfer and special hot foil stamping. 2) Stamping materials: all kinds of fabric, textiles and leather. 3) Application fields: packaging for various top grade finery, T-shirts, fashionable dresses, household products, hotel products, office and casino, curtain, gift ribbons,etc. b) Much attention must be paid to the good match of temperature and gluewater. 5) Recommended stamping parameter: about 95-130 °C temperature; hot foil stamping speed:30-60 m/min, hot foil stamping heat preservation for about 12 hours in the glasshouse under temperature of 50 °C .